With more than 3,400 km of coastline, Vietnam is one of the countries that have the advantage of maritime tourism development. More and more domestic and international tourists like travelling at sea and this tourism form is currently seen as the ‘golden egg’ not only in Vietnam but also in many countries in the world. Cruise tourism has developed rapidly in both quantity and quality in recent years to meet high demands of tourists. With rich and diverse marine resources, Vietnam's tourism industry has many advantages to develop this attractive tourism. The pristine beauty of the long white sand, gentle blue sea, luxuriant tropical islands or magnificent coral reefs has been so hearty to so many travellers. At the same time, Vietnam is well-located in the middle of the two largest cruise tourism centres in the region - Hong Kong and Singapore - which creates a ‘big door’ for Vietnam to approach other countries in the region and in the world from the East Sea. According to data from the Cruise Lines International Association (CLIA), the demand for leisure cruise tourism in Vietnam rose by 126 per cent in the 2012 - 2016 period, the highest growth among Asian countries. In 2012, there were only 158 Vietnamese cruise passengers but, in 2016, this number was more than 4,100, demonstrating Vietnam’s huge potential for cruise travel demand. Although Vietnamese cruise tourists accounted for only 0.1 per cent of total Asian cruise passengers in 2017 (China: 67.8 per cent, Japan: 7 per cent, and Singapore: 6.4 per cent), according to assessments by shipping lines, Vietnam has a lot of potential to be tapped thanks to rising demand of Vietnamese people for outbound tours. This makes the country an attractive market in the eyes of luxury cruise liners. Farriek Tawfik, Director for Southeast Asia of Princess Cruises, said, “we will increase cruise voyages to Vietnam to 31 (with 80,000 international tourists on dock) in 2018 in order to meet the growing demand for cruise tourism in the country”. At present, Princess Cruises is considered the largest five-star cruise ship in Southeast Asia with many voyages to popular destinations in Europe and Asia. Cruise tourism is seen growing quickly in Vietnam. However, according to researchers, the current rapid growth is still well below the actual potential. To draw more tourists, we need to further improve policies and upgrade tourism infrastructure, facilities and products. Particularly, nowadays, international cruise tourists entering Vietnam can take visa for just US$5 each. Visa granting procedures have been simplified and quickly settled. 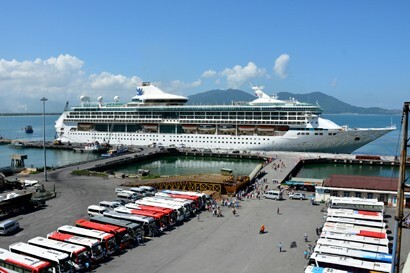 According to the Vietnam National Administration of Tourism (VNAT), Vietnam currently has some deep-water ports available for international cruise liners such as Thi Vai - Cai Mep Port Complex (Ba Ria - Vung Tau province), Phu My Port (Ba Ria - Vung Tau), Chan May (Thua Thien - Hue), Tien Sa (Da Nang), Ha Long (Quang Ninh) and Cam Ranh (Khanh Hoa). These terminals are being upgraded to better serve tourists and make cruise tourism a major segment of Vietnamese tourism industry. In addition, many businesses have invested in constructing high-end complex spaces featured by stations, departure lounges, operating areas, hotels, restaurants, trade centres, golf courses, international hospitals and capable of accommodating giant liners to dock like Tuan Chau Port in Ha Long Bay or Cai Mep Port (Ba Ria - Vung Tau). In addition to the seaport system, Vietnam's tourism industry needs to upgrade existing routes and attractions and build new ones to interest tourists to create special tours. The sector needs to pay particular attention to visiting world heritage sites, cultural relics and natural sceneries along the coast. Ms Nguyen Thanh Tra from Saigon Tourist Corporation said, “Most cruise tourists are high-class and come in big groups (thousands of travellers each port call). Their spending power is very strong. Therefore, travel companies should upgrade and develop more new products to meet their needs for entertainment, leisure and shopping to stimulate them to spend. By tapping potential of gorgeous nature, culture, history, cuisine and people, attractions in Vietnam are now more magnetic to domestic and international tourists. This is also a favourable condition for Vietnam's cruise tourism to grow more strongly. At the same time, with concrete strategies and action plans, cruise tourism in Vietnam will soon achieve good results and significantly contribute to national economic and social development.